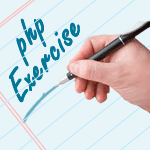 Calculate the difference between two dates using PHP OOP approach. Previous: Write a PHP class that sorts an ordered integer array with the help of sort() function. Next: Write a PHP calculator class which will accept two values as arguments, then add them, subtract them, multiply them together, or divide them on request.